Fairy Tale Fandom: Four-Color Fairy Tales: Rapunzel's Revenge. Four-Color Fairy Tales: Rapunzel's Revenge. I had said before that I wanted to tackle reviewing more comics that were created for the book market than the comics market. Despite that, I’ve been sitting on this one particular graphic novel for a while, not knowing in particular how to tackle it. So, I’m just going to wing it here. Rapunzel’s Revenge is a children’s graphic novel from 2008 written by award-winning novelist Shannon Hale and her husband Dean Hale, drawn by the talented and altogether unrelated artist Nathan Hale and published by Bloomsbury USA Children’s Books. The story is set in a mythical version of the Old West (read “mythical” as “kind of weird and fantastical”). A young girl named Rapunzel lives in a grand villa with Mother Gothel, the woman she believes is her mother. Her “mother” is quite known for having magic that makes things grow. The only problem with living in the villa is that there is a very high wall around it and Rapunzel wants to see what’s on the other side. So, one day she uses a rope trick learned from one of the guards to swing to the top of the wall. What she sees on the other side is disturbing. The world beyond the wall is nothing like the world inside it. Whereas the villa’s gardens are lush and green, the world outside is barren and bleak. In the outside world, people toil as slaves. Yet another shock for Rapunzel, one of those slaves turns out to be her real mother. Faced with this grand reveal, Rapunzel faces Mother Gothel and ends up imprisoned in one singularly towering tree. Rapunzel though, ends up using her hair that has grown incredibly long from all the growth magic surrounding her to escape. She then ends up teaming with a roguish young man named Jack to make her way back to Gothel’s villa to free her mother and get revenge against Gothel, all the while using her hair as whips or lassos as needed. There’s not much to complain about here. The writing is solid. The art tells the story well. The setting is unique if a little weird (there are jackalopes. Sometimes people ride bison. You just go with it). The characters are charming and likable. There are a couple places where the story seems to meander, but I can forgive that. It’s Rapunzel’s first time outside, so she’s owed some meandering. Also, the folksy dialogue can sometimes seem a bit phony. Though, I find I can forgive some of the negatives knowing that it’s a graphic novel for kids. Not everything necessarily needs to hold up to adult scrutiny. I know that not everything I loved as a child does (ever seen an old late ‘80s Teenage Mutant Ninja Turtles cartoon now? Yeesh). I’m really most impressed by how well the Hales know their fairy tales and incorporate bits of Rapunzel that people don’t always remember into the narrative. Sure, the story goes off the rails that the old tale set once Rapunzel escapes, but it’s supposed to. They also skip the whole “let me climb your hair” bit because if Gothel has magic, why wouldn’t she be able to get up there herself. No, what impressed me is how Rapunzel isn’t put in the tree/tower until she’s 12 years of age, just like it says in the Grimm tale. No, really. Go give it another read. Before giving it a serious read, I always assumed that Rapunzel was always in that tower, since the moment Mother Gothel got a hold of her. But the tale says she was placed in the tower at age 12, and that’s the approach the Hales take. Granted, they sidestep all that adult subtext about the witch essentially locking Rapunzel away the minute she hit puberty, essentially trying to keep her from growing up and forestalling her sexual awakening. But like I said, it’s a kids’ book. It should come as no surprise that Shannon Hale and company know their tales seeing as Shannon Hale is the same woman who turned the obscure tale “The Goose Girl” into her first and often most fondly remembered novels. Just as notable as any of that is Rapunzel’s relationship with Jack. However, that’s something with wider and somewhat more frustrating connotations. Basically, it says a whole lot about how and when people are receptive to “twists” on fairy tales. Essentially, the crux of the idea is this: the idealistic and sheltered Rapunzel pairs up with a somewhat foolish, world-weary rogue. Stop me if you’ve heard this one before. Yes, that’s right. It’s much the same dynamic as Rapunzel and Flynn Rider in Disney’s Tangled and Cress and Carswell Thorne in The Lunar Chronicles novels. It seems like such a no-brainer now, to pair such character types together. They seem like the absolute best personalities to play off of each other. There’s even a precedent for it when you consider how the prince in the original tale was essentially a glorified burglar. He preys on Rapunzel’s naivete which allows him to essentially break into her home. The difference is that he doesn’t really want to steal anything but Rapunzel, which he never even manages to do. Rapunzel’s Revenge doesn’t have that bit. She meets Jack when she’s on the road after having escaped her prison (I’m hesitant to use the phrase “rescued herself” despite its popularity in fairy tale feminism circles. The reason being that if someone else does it, it’s a “rescue” but if the captured person does it it’s an “escape”. I get why people say it, but semantically it’s a really odd phrase). The thing is that near as I can tell, this is the first time such a pairing has happened. I seem to even recall reading a snippet of something in which Hale says she felt a bit robbed when Disney’s Tangled came out (I don’t have the link, so don’t quote me). Yet, I’m not sure how many people acknowledge this. It really reminds me of just how much stock people put in movies and television in our culture. The same issue can be observed with ABC’s show Once Upon a Time. I’ve encountered any number of fans online who praise the show for its “twists”, while my reaction has usually been “What twists? You mean that old thing they did again?” The thing is that about 90% of the supposed twists on old fairy tales presented in that show have been done before in literature, comics or even Jay Ward Fractured Fairy Tale cartoons. However, since the general populace hasn’t encountered them before they’re not viewed as cliché but novel. This seems to be the case with most examples. Most twists, changes and revisions have been done a number of times before in quieter media before someone stumbled on the idea and put them in a movie or on TV. It’s a fact that most fairy tale fans are likely just going to have to grin and bear. Now, which rogue do I like best? Well, Flynn Rider makes me laugh and I really like Carswell Thorne’s character arc, however Jack receives major points for being the same Jack as the one from “Jack and the Beanstalk”. What, did I forget to mention that part? Overall, Rapunzel’s Revenge is a fun little graphic novel and probably a good way of introducing kids to the medium. The heroes have a fun dynamic and the setting is unique. While maybe not a “go out and read this now” book, I do recommend giving it a shot. It’s great that you reviewed something different this time. The novel seems like good read for the kids. I like how you judged the novel on the basis of how a kid would like it because it is meant for them only. We used to read fairy tales and even liked to hear from our grandparents when we were kids. But i think this trend is now changed. A Post for Papa Polendina. 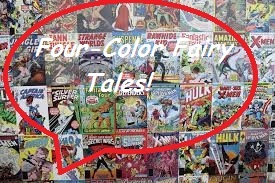 Four-Color Fairy Tales: X-Men Fairy Tales.